Centrally located in Puerto Mogán, just a short walk from the charming marina and steps away from the beach, the Cordial Mogán Playa is an ideal choice for those looking for a laid-back retreat. The hotel's beautiful grounds are immaculately maintained, with expansive botanic gardens offering over 450 species of subtropical plants and an archaeological park. Well-appointed guest rooms are laid out around courtyards and terraces and two swimming pools provide the perfect setting to relax, with the Spa & Wellness Centre on hand for those who want to indulge. 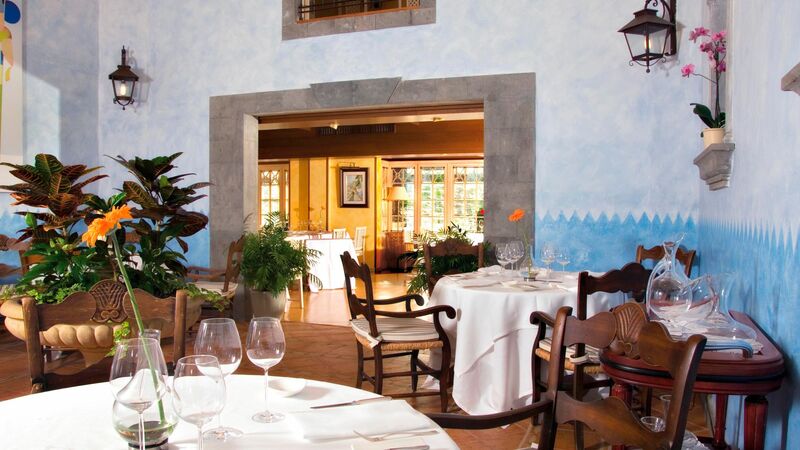 A choice of restaurants offer a wide range of dishes and Los Guayres, run by renowned Canarian Chef Aléxis Álvarez, provides an ideal setting to sample creative Canarian cuisine. Families are well catered for at this hotel, with a kids' club and children's pool, as well as daytime activities and evening entertainment. 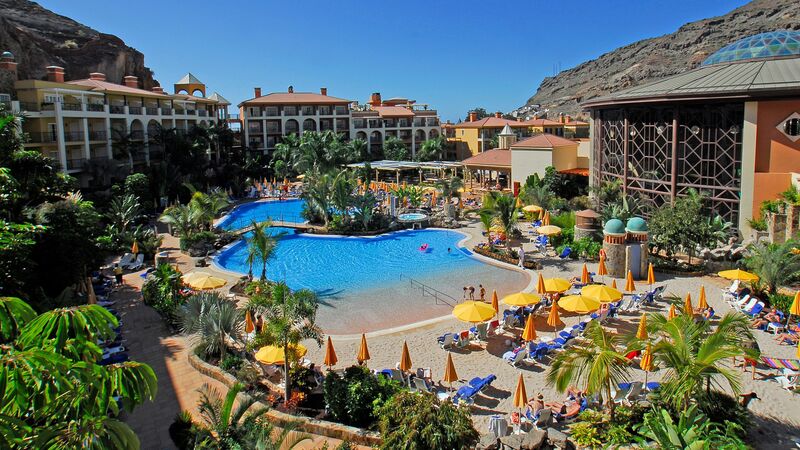 Boasting a good range of facilities, an enviable location and friendly service, the Cordial Mogán Playa promises to offer a warm welcome and a memorable stay. A range of hotel child prices apply to ages 3-6 and 7-12 years. The hotel has 487 rooms. 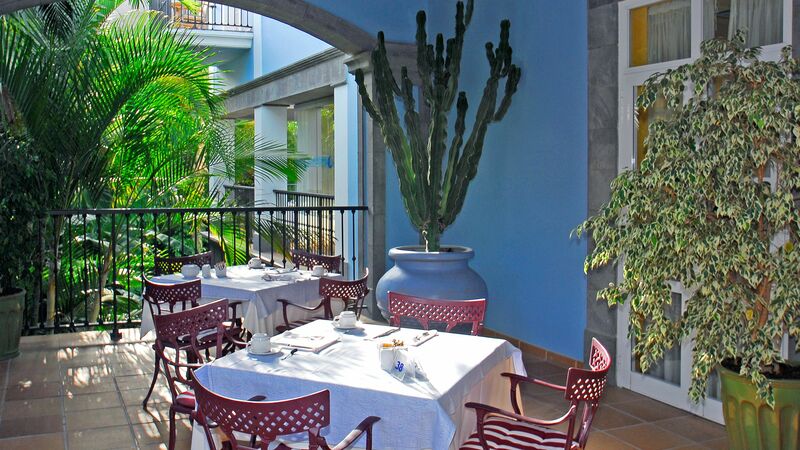 Run by renowned Canarian chef Aléxis Álverez, this restaurant offers creative Canarian cuisine. Guests on half board and full board can receive a credit towards meals at this restaurant. Reservations are required for this restaurant. 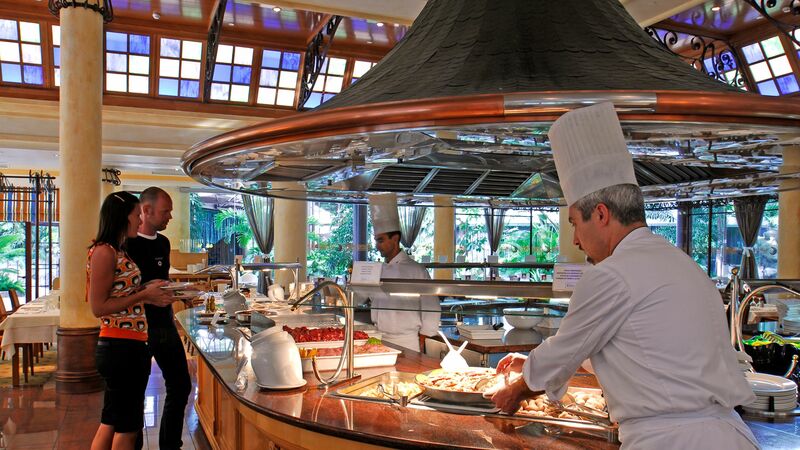 This large buffet restaurant serves a range of cuisine with show cooking stations, it has views over the lagoon through its large picture windows. A bar open until late with live music and shows. A buffet restaurant open for lunch and snacks. The restaurant serves breakfast for guests staying in Junior Suites. Open for drinks during the evening. The Blue House Buffet offers a variety of cuisine including meat and fish from the grill as well as several pasta dishes, paella, salads and Spanish and international specialities. Guests on Full Board and Full Board Plus will dine here for lunch. There is a choice of two pools with one where you will find games and activities such as aqua aerobics, and the other offering a quieter experience with more shade. The beach is located just a few steps from the hotel. The hotel boasts a range of children's activities, including those at the kids' club. From pool games to challenging interactive activities, this club is a great place for your children to go to let of some steam. Spa Inagua offers guests indoor and outdoor space. 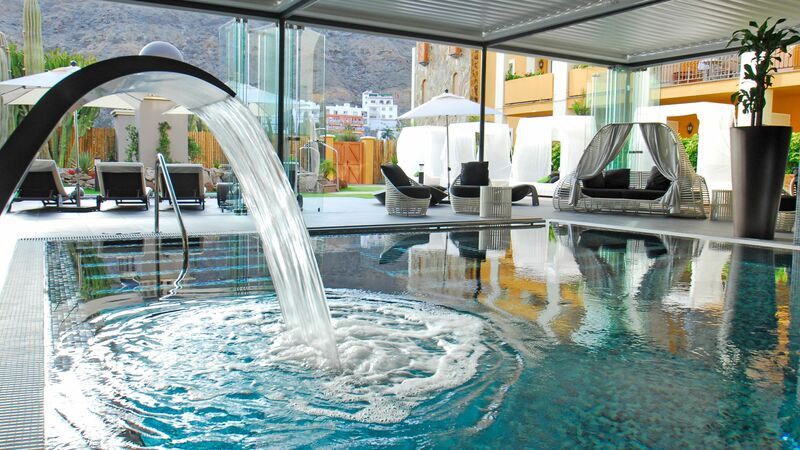 There is a dynamic spa with hydrotherapy facilities, steam bath, sauna and themed showers. 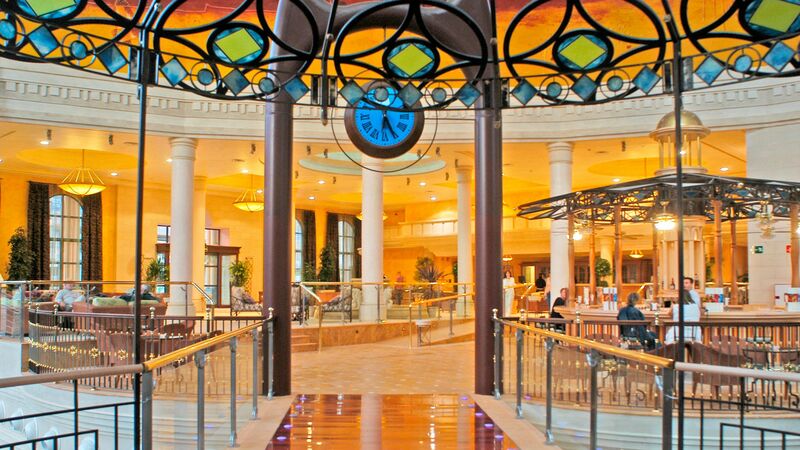 Outside you will find hot and cold water baths and a floatarium with water charged with magnesium salts. There are indoor and outdoor treatment rooms, including rooms for couples. There is a charge for hotel guests to use the spa. Please note children under 18 years are not permitted in the spa. 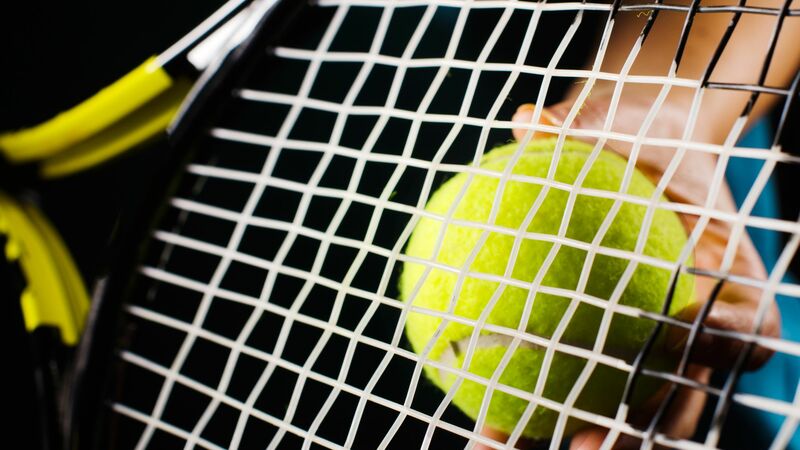 The hotel offers an array of courts, making it the ideal destination for a fan of the sport. Squash courts are also available should you wish to try a different game. 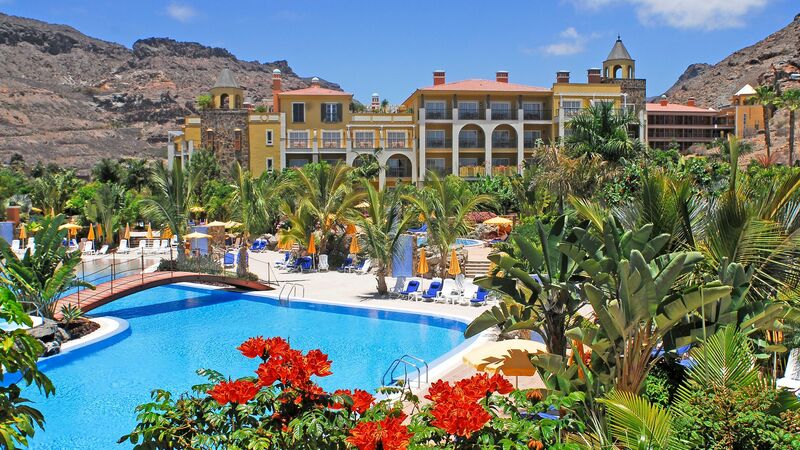 Tucked in Gran Canaria's south-west coast is the picture-perfect village of Puerto Mogan. This tiny fishing port wins new fans every year with its cobbled streets and cluster of bougainvillea-draped villas. Nicknamed 'Little Venice' for its beautiful network of canals and bridges, Puerto Mogan's vibrant marina is the heart of the resort. Packed with gleaming yachts moored up beside a white sandy beach, the marina is a good spot for watersports and sailing, and has the lion's share of the resort's bars and restaurants. 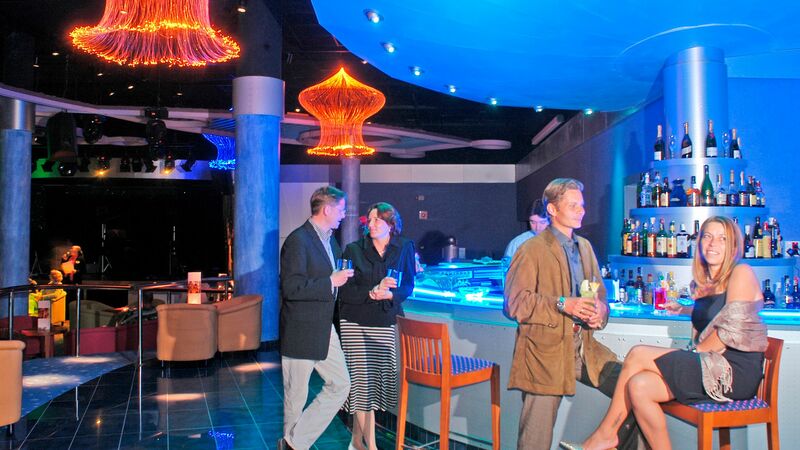 Expect plenty of fresh seafood and Canarian cuisine (traditional Spanish with African and South American influences). The marina has lots of little boutiques and a Canary handicraft market every Monday morning - ideal for souvenir shopping. Double Rooms are furnished in classic style with a double or twin beds. The rooms have a bathroom with bathtub and separate shower and are equipped with a TV, air conditioning and hairdryer. Junior Suites are spacious and decorated in warm colours with a separate living area, these rooms have a large terrace or balcony. The suites are equipped with a TV, air conditioning and a hairdryer. Single Rooms measure 33m² and are simply furnished in a classic style with a single bed. Rooms have a bathroom with shower over bathtub and are equipped with air conditioning, TV and hairdryer. Save up to 14% on the hotel price for holidays between 01 May - 31 October 2019 booked by 31 March 2019. Save up to 20% on the hotel price for holidays between 20 March - 30 April 2019 booked by 05 April 2019. Visited in March on a ladies trip with my mum. Fell in love with the place as soon as we arrived. Beautiful interiors and exteriors which are immaculately clean. Staff were outstanding. They couldn't have been any more friendly and helpful especially the staff in the downstairs entertainment bar making wonderful cocktails and the man who gave a tour of the hotel. Our room was spacious, comfortable and perfectly clean with lovely views of the main pool. We stayed half board with breakfast and dinner and swapped one dinner for lunch. There was something to suit every age and taste and each day there was a different selection of food. There's a range of daily activities for both adults and children, wonderful pool spaces and a beautiful spa. We even had our photos taken by an onsite photographer which is a great treat and picked them up before we left. The hotel is a five minute stroll to the harbour which is loaded with beautiful restaurants and boutiques. There's a bus station beside the hotel which takes you directly to the airport for about ? ?7 each way and also goes to different towns and activity parks. I simply cannot recommend this hotel enough. If you want a week in heaven as a couple, friends or with family then this is the place to go. You certainly wont be disappointed. We are returning again next March and hopefully this will be an annual occurrence. Cannot speak too highly of this hotel. Although a large property, it doesn?? ?t feel like it. The grounds and gardens are stunning. Our Junior Suite was lovely. Great pool which was so warm - lovely ! We planned to eat out, but the food was so good and with the evening entertainment provided, we didn?? ?t venture far from the hotel. A great hotel which is obviously well managed in all departments. Thank you for a lovely holiday.